Shamrock Rovers star Graham Burke. SHAMROCK ROVERS MANAGER Stephen Bradley has expressed his delight over Graham Burke’s international recognition. However, the Hoops boss plans to speak to Martin O’Neill about the 24-year-old attacker’s availability for the Republic of Ireland’s three upcoming friendlies. Burke was yesterday included in O’Neill’s squad for the games against Celtic in Glasgow on 20 May (Scott Brown’s testimonial), France in Paris on 28 May, and USA in Dublin on 2 June. 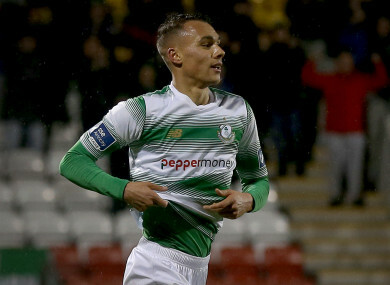 Bradley acknowledged that Burke’s call-up is good news for Shamrock Rovers and the League of Ireland as a whole, but it could potentially have a detrimental impact on his club. The day before Scott Brown’s testimonial, the Hoops are due to travel to play Sligo Rovers (19 May) in the first of three Premier Division games in the space of seven days. They then host St Patrick’s Athletic (22 May) before an away fixture with old rivals Bohemians (25 May). Bradley’s side welcome Dundalk to Tallaght on 1 June, 24 hours prior to the USA’s visit to the Aviva Stadium. Shamrock Rovers are currently in fifth place in the top flight of the SSE Airtricity League ahead of tonight’s clash with in-form Waterford. Burke, who returned to Ireland last season after spells with Aston Villa, Shrewsbury Town and Notts County, has scored nine league goals this term, a tally that has only been matched by Dundalk striker Patrick Hoban. Email “Rovers boss to discuss Graham Burke's availability with Martin O'Neill”. Feedback on “Rovers boss to discuss Graham Burke's availability with Martin O'Neill”.